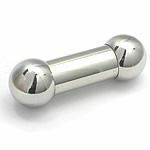 This 0g (8.0mm) straight barbell is available in various sizes, from 1/2” (13.0mm) through 3/4” (19mm). The two 12mm steel balls thread into the 2.0mm internal threading at both ends of the barbell. These barbells are crafted from 316L ASTM F-138 Implant Grade Stainless Steel making them a great option for a variety of piercings.